"An unambiguous triumph." Netflix has debuted a second trailer for Angelina Jolie's latest film First They Killed My Father, which is already playing in cinemas and on Netflix now. They're hoping to drum up extra buzz and bring attention to this film, even though it's already available on Netflix. 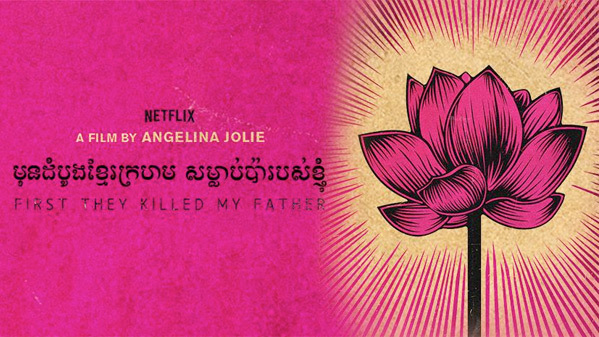 The full title for the film is First They Killed My Father: A Daughter of Cambodia Remembers, based on the book written by Loung Ung, who also co-wrote the script with Jolie. It tells the story of the deadly Khmer Rouge regime in Cambodia, which was the corrupt Communist Party that lead the Cambodian genocide. The authentic cast includes Sareum Srey Moch, Phoeung Kompheak, and Sveng Socheata. The film received some rave reviews out of the Telluride Film Festival, and it looks like a very powerful, historic drama. It's worth a look. You can also still watch the first trailer for Jolie's First They Killed My Father here, to see more footage. First They Killed My Father is the adaptation of Cambodian author and human rights activist Loung Ung’s gripping memoir of surviving the deadly Khmer Rouge regime from 1975 to 1978. The story is told through her eyes, from the age of five, when the Khmer Rouge came to power, to nine years old. The film depicts the indomitable spirit & devotion of Loung and her family as they struggle to stay together during the Khmer Rouge years. First They Killed My Father is directed by American actor-turned-filmmaker Angelina Jolie, director of the films In the Land of Blood and Honey, Unbroken, and By the Sea. The screenplay is written by Loung Ung & Angelina Jolie, based on Loung Ung's book of the same name. Netflix will release First They Killed My Father in select theaters + streaming starting September 15th in the fall.